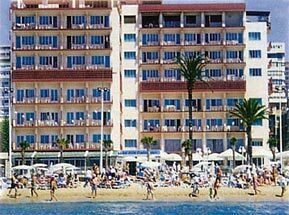 The Hotel Sol Costa Blanca is located on Levante Beach. This is a good location for shopping and easy access to all the tourist attractions. The hotel has 185 guest rooms, which are air conditioned and well equipped with modern facilities. The hotel also has a buffet restaurant with show cooking providing a varied choice of food. There is also an outdoor swimming pool and on an evening guests can dance to live music.